1,000,000th Hit Gift From John Kim & Naska! Thanks to visitors like you, the Madman's Cafe finally Celebrates its 1 Millionth Hit!!! 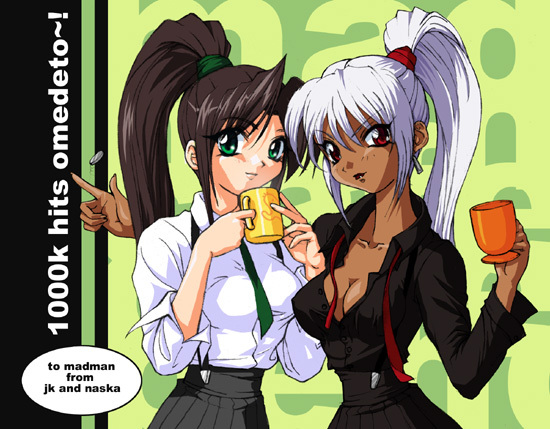 Thanks to John Kim and Naska Chijoue, artwork of the new mascot character for the Madman's Cafe- "Dita", was drawn in a 1P and 2P version! Thanks a million arcade credits, John & Naska! For more Excellent artworks and a funky drawing board, check out Pendako- the MMCafe's their neighbor, right here on syste.ms!